Pop Chips very kindly sent me some new flavours to try. 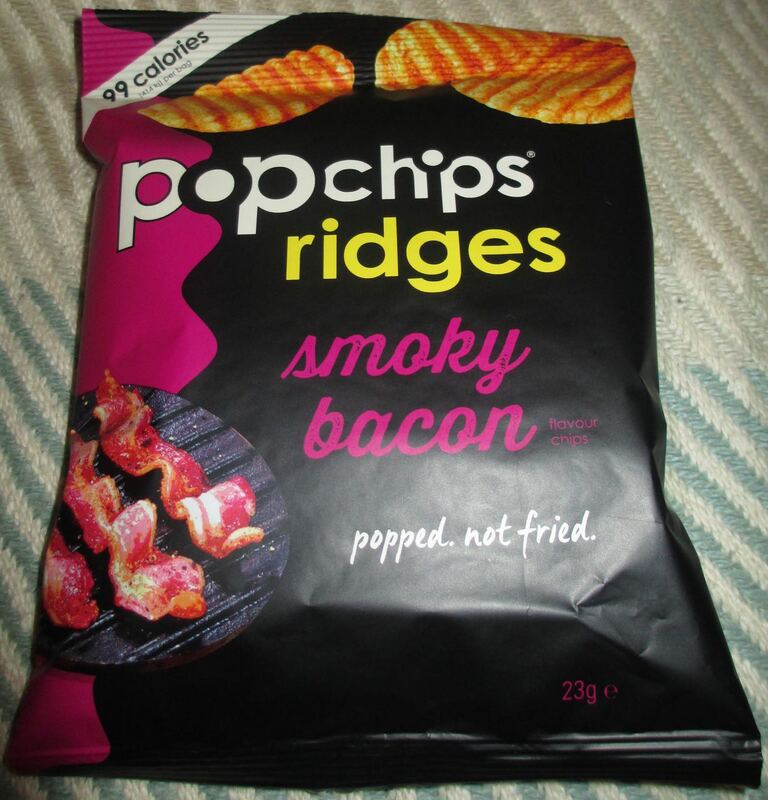 These new Pop Chips Ridges are Smoky Bacon flavoured. 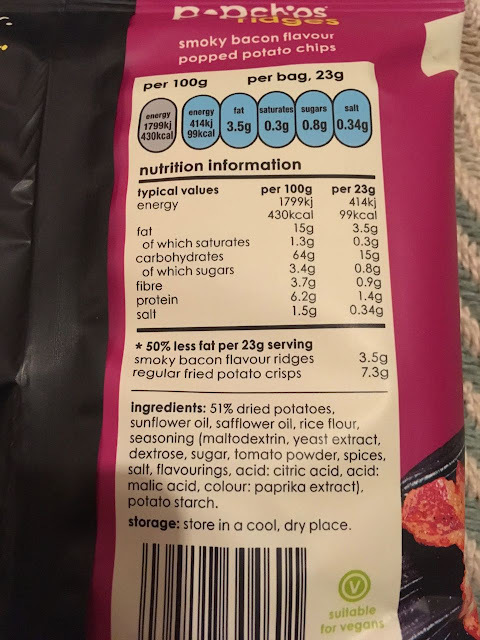 There is an image of sizzling bacon on the front of the packet, as well as one with ridge crisps that look like rounded bacon slices. From these images I was expecting an explosion of smoky bacon from each crisp. Indeed the back of the packet boasted of a “bold flavour”. As usual with Pop Chips the potatoes used to make these Ridges were cooked at high heat and then pressure was added until the crisps popped. The crisps are not deep fried and so have half the fat of regular crisps; they are also without grease which makes for a healthier crunchier crisp. There was a mild smell of bacon on opening the packet mixed in well with the baked crisp aroma. The punch comes from the flavour itself. There is an explosion of smoky bacon with every Pop Chip. The crisps themselves made my mouth water. With each crisp I found myself sucking every ounce of flavour and bathing in the glow of smoky bacon. These crisps taste fantastic and slightly different than the norm. They have a mild spice to them that left a hint of chilli spices in my mouth in the aftertaste of every crisp. These Pop Chips are well worth a try. Easily one of the tastiest bacon flavoured crisps I’ve eaten, and the spices give an innovative edge to the usual smoky bacon flavour. There is also Sea Salt and Vinegar Ridges Pop Chips in the new range, which have more of a pronounced vinegar taste mixed in with the baked potato crisps flavour and sea salt. I have a packet of the Crazy Hot flavour in stock, which I’ll be writing about in the future. I’m looking forward to some chilli heat there and the dread of stopping eating them in case my head explodes! The 23g packet has 99 calories, with 3.5g of fat, 0.8g of sugar and 0.34g of salt. These crisps are suitable for vegans, and have no artificial ingredients; see photograph.